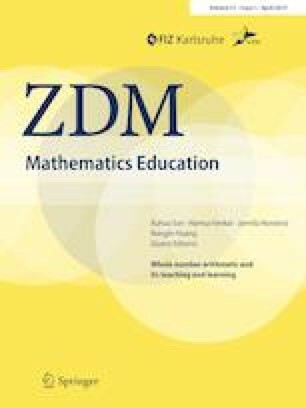 Teachers and mathematicians hold different perspectives on the teaching and learning of whole number arithmetic. Though these perspectives may be complementary, sharing them across communities is challenging. An unusual professional development course for primary school teachers, initiated and taught by research mathematicians, provided a setting for productive sharing of both mathematical and pedagogical perspectives. Drawing on the theory of commognition, I analyze two lesson segments, one, designed by one of the mathematician-instructors, included a discussion of an alternate method for performing vertical subtraction; the other, initiated by a 3rd grade teacher, is a discussion of an authentic classroom activity. Through these analyses, and drawing on the notion of boundary as sociocultural differences between communities, I reveal some mechanisms of the perspective-sharing that took place, and discuss what and how the parties learned from and with each other. I also highlight the role of a participant-observer researcher as a broker in this process, supporting events of boundary-crossing in which the parties came to explicate, and sometimes change, their own perspectives on teaching and learning mathematics with respect to the perspectives of others. I propose this PD setting as a model for sharing perspectives across these communities. This research was supported by the Israel Science Foundation (Grant no. 615/13). Sincere thanks are due to Abraham Arcavi for his guidance and advice. Cooper, J. (2016). Mathematicians and primary school teachers learning from each other. Unpublished doctoral dissertation, Weizmann Institute of Science, Israel. Retrieved Dec. 15, 2017, from https://stwww1.weizmann.ac.il/wp-content/uploads/2016/09/Cooper-dissertation-finalAppendix.pdf. Israeli Mathematicians. (2010). Math-Program-letter.pdf. Retrieved Dec. 15, 2017, from http://www.wisdom.weizmann.ac.il/~dnovikov/MathEd/Math-Program-letter.pdf. Klein, D., Askey, R., Milgram, R. J., Wu, H.-H., Scharlemann, M., & Tsang, B. (1999). An open letter to Richard Riley, United States Secretary of Education. Retrieved Dec. 15, 2017, from California State University Northridge. http://www.csun.edu/~vcmth00m/riley.html. Overview of ICMI. (2017). Retrieved Dec. 15, 2017, from International Commission on Mathematics Instruction. http://www.mathunion.org/icmi/icmi/overview-of-icmi/. Pedagogical Secretariat of the Israeli Ministry of Education. (2009, 6 24). A new mathematics curriculum for primary school for all sectors (in Hebrew). Retrieved Dec. 15, 2017, from http://cms.education.gov.il/EducationCMS/Units/Tochniyot_Limudim/Math_Yesodi/PDF/.